As I sat listening to the love theme that prevailed through all the outpourings of the lives lived, then and now, by the young and not so young, and the well seasoned; I was struck by the thread that linked all of the stories, all of the panelists, the love of family, the need of belonging to family, the strength that it gives you no matter how far apart you may be from them. It was carried across borders and countries; if the determination and the desire to express it was strong enough. Over and over we heard that communication was important, as difficult as it may have been when people could only call on Sunday’s because of rates as related by Peter, or tapes being sent to be read to grandchildren at bedtime by the grandparents, as told to us by Daniella. We all identified with those memories and appreciated the constraints. 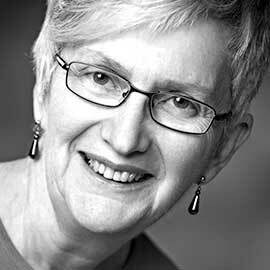 Best-selling author Meg Hickling is a Registered Nurse who has been a sexual-health educator for more than 25 years. Her ability to convey difficult material with sensitivity, gentle humour and warmth distinguishes hers a remarkable teacher and role model. As a mother and grandmother, she understands the complex relationships within families. 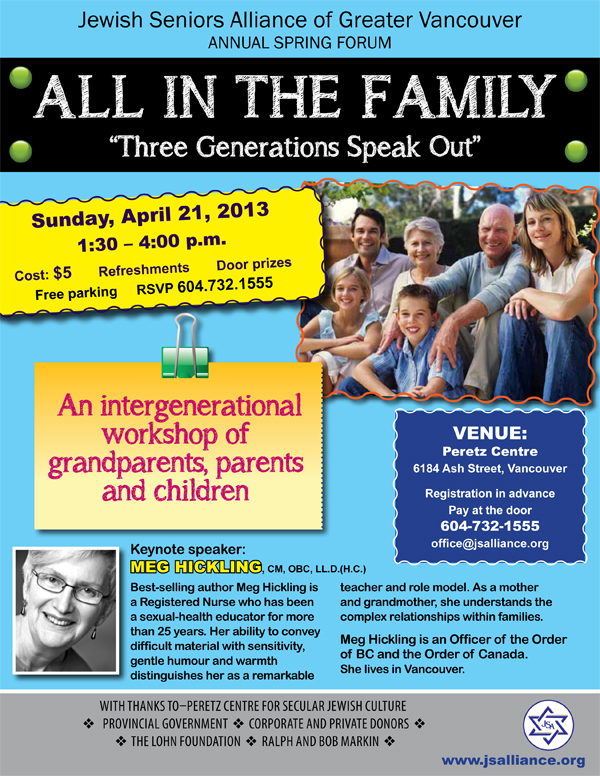 Even our key speaker Meg Hickling, noted author and a sexual -health educator shared with us anecdotes of her grandchildren asking questions at sometimes inopportune moments and offered advice as to how to answer truthfully, thoughtfully and appropriately! We were amazed to learn that this would be her last speaking engagement as she was officially retiring, perhaps to devote more time to her family, and her adoring grandchildren. She cautioned us to always make sure that the parents of the children were on the same page as you in their thinking, and to constantly reassure the child asking questions that he/she could always turn to you for advice, comfort and information. She stressed that above all we must protect them from harm! Ken Levitt opened the afternoon with 2 questions as to our diet and exercise that morning, continuing the JSA theme of making sure we were being the best senior we could be, and then our President Serge Haber gave a little background of the JSA organization, celebrating ten years of existence on June 17th at Beth Tikvah Shul, listing what our organization has been doing recently, accomplishing more each year, growing and continuing to meet the needs of our community. A question and answer period followed and judging from the response of the audience, there were many people who wanted to be able to answer their grandchildren, in a manner that would be understood at the correct level. Our first panelist was Dr. Anneliese Robens, who combined her knowledge as a Registered Psychologist and as a grandmother, to give us tips on grandparenting, reminding us that we are models for our grandchildren to emulate, reminding that connecting is of prime importance, Skype/record read stories and continue to stay connected. She urged us to make sure that all visit were mutually happy reminding us that not all grandchildren want to be hugged and pinched at our will. Unconditional love and caring bestowed will remain in their hearts. Our next presenter was Bernie Simpson, a personal injury lawyer with much experience in receiving prestigious awards, but he admits now that the best gifts he was given were the three grandchildren he now has and dotes on. It was they who taught him how to care, to love and feel emotions he never felt as a father, because he was usually so busy. A common situation for many who work constantly and find little time for relaxing with family. The next panelist was Daniella Givon born in Israel who demonstrated that distance is not really a deterrent to ensuring that the grandchildren feel the love their long distance grandparents wanted to convey¬–through Skyping, through phone calls, through extended visits, trying to lessen the distance existing, and was quite successful. Love can cross borders. Our next speaker was Dr. Peter Lutsky, a well known and caring Family physician who filled us in on family life in Edmonton where his father, a Pinsker and mother, a Canadian established a home and raised their family with good Jewish values. Peter attended Talmud Torah there, as did Peter and Shari’s children ensuring the continuance of the values learned in his parent’s home. You are the model for your children to emulate as one other presenter had said. His children are now getting ready to test their wings while they fly off to universities of their choice, as their roots have been well established and following an example set by their older brother…so the long distance parenting will come into play. Our first teen to deliver his ideas was Yaakov Bellas and deliver is the correct term as he hopes to be theatre bound in the future. He now has already had the leads in several productions, one of which was Tevye in Fiddler. He credits his grandparents for opening his eyes and heart to the glories and wonders of Broadway by taking him at the young age of ten to one of the productions and suddenly HE KNEW what the path ahead would be. He also says that they encourage him in all that he does saying that he is GREAT, even though there may be times he know he is NOT, but never the less, that validation always give him the motivation to succeed. Knowing he can turn to them when he has had a bad day..is a source of comfort to him. Our youngest presenter was a poised young lady of 12, Magalee Blumenkrans who attends Talmud Torah. She enjoys exchanging recipes, and swimming with her grandparents as she is very athletic. She wants to base her future on what she has learned from her grandparents. Our last two speakers – cousins Rachel Kahn (17) and Kira Smordin (almost 17) continuing to demonstrate the bond of family – chose to present together. They both attend King David High School in Gr.11, and enjoy travelling and family outings. Having shared a grandfather, they can both recall his pinching their cheeks and tussies and his requests for choking hugs, all out of love. One of their favourite-shared memories is going into their Bubbie’s closet and trying on her countless shoes. They laughed as they were both reminded of something they thought was a stuffed toy animal, which turned to be a fur coat. Their grandparents had a huge impact on both their lives. Jacqui Sankoff personally and expertly thanked all our presenters by offering each one with little gift of appreciation from the JSA. A tangible thank you, other than the sincere applause extended to them by the admiring audience. Our incredible office staff, without whom NOTHING would get done–Karon Shear and Rita Propp were given flowers of thankful appreciation. A huge array of door prizes had Jennie Virtue running all over the hall to all the eager recipients holding tickets and making them very happy. The delicious food placed on the tables was skillfully prepared by the Mitzvah Makers and thoroughly enjoyed by everyone! It was an afternoon which truly demonstrated “mi dor le dor” “from generation to generation”, in all its true essence. A sincere heartfelt thank you for all the hard work, many hours of planning and preparation to the dedicated people who put together this enjoyable and enlightening afternoon. Kol hakavod, much appreciated. Todah Rabbah to Karon and Stan Shear who have videotaped the presentations which will appear on our JSA website for those who were not able to share this very special ‘All in the Family’ afternoon with us in person. In appreciation, my hat’s off to you, one of my many.